It’s funny how once you become a mom, you realize how little time you have to get sick. And also how little time you have to take care of yourself so you don’t get sick. I can still remember thinking that the odds were against us as my first child went to daycare and brought back every single germ known to man. Already sleep deprived and searching for time in my day to eat lunch, let alone exercise or take a vitamin – I was sick ALL. THE. TIME. Six years and three kids later, I’m not sick as often, and I’ve finally figured out how important it is to take care of myself. 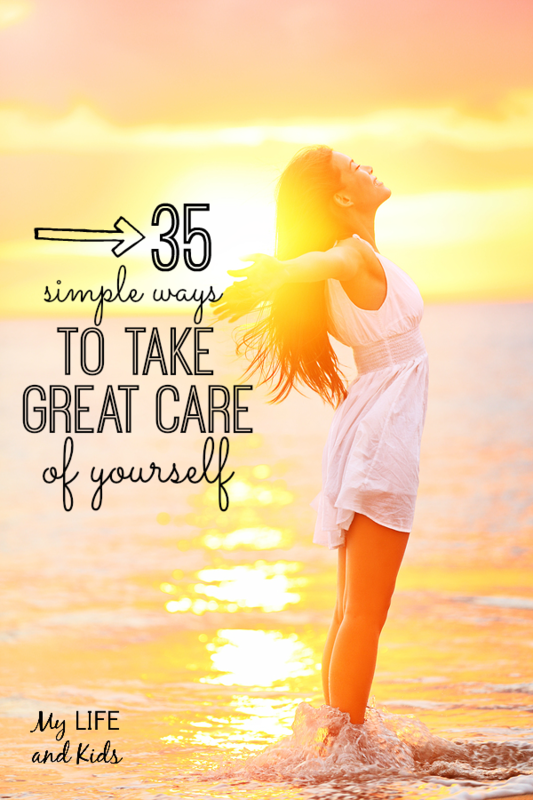 In the spirit of International Self-Care Day (yes, that’s a thing, and it’s happening on July 24th) – I’m sharing 35 ways to take better care of yourself. Do them all every day. Do one of them a day. Do one of them a month. Just do what you can – as we all strive for better self care! 3. Go to the doctor at least once a year. 6. Go to the bathroom. Alone. 8. Think about taking a multivitamin. 9. Get some exercise. Try. 11. Sleep. Like – seriously – get some sleep. 12. Find something that’s relaxing – whether it’s getting a manicure, watching reality television or getting a massage. Make time for it. 13. Get outside. Fresh air is good for you. 14. Remember #1? Do it again. 17. Pay it forward. Volunteer. Whatever you can manage – just do it. 21. Be present. Put down the phone, just be here. 22. Brush your teeth. At least twice a day. 25. Go to the dentist. 26. Do something that makes you feel beautiful – whether that means dress clothes or pajamas, mascara or a clean face. 28. Now drink more water. 29. Now do that every day. 31. Repeat 1 – 30 as often as possible. 34. Laugh out loud again. 35. Share this infographic with your friends so they can take better care of themselves too. What are your tips for great self care? Love this list of east to do ideas. What a great reminder to take care of our selves because we have a whole family depending on us!